What may be the most unenlightening collection of pop epistemology, or theolosomethingorother, ever somehow commanded space in the NYT this week, beginning with totally wooly noodling by a self-proclaimed creationist that somehow got six more people to outgas on it. The operative question is framed asÂ “believing in” science (and its big-bang, old-universe, evolutionary branches), or a literal interpretation of Genesis. I write as one who became a devout atheist at the age of nine, and has encountered nothing since â€“ with the two exceptions of the globe artichoke and the mango â€“ that hints at the work of an intelligent super-being. And yet whenever I hear Dawkins on the car radio, spluttering lividly at the stupidity of those who cannot see the truth as clearly as he does, the instinct is to do a handbrake turn and drive like a maniac to the nearest church, synagogue, temple or mosque. He preaches so conceitedly, and with such poisonously illiberal scorn for those who follow the great faiths, that I want to worship alongside every one of them…Dawkins is more repressively dogmatic than the Ayatollahs. To this, Bernstein responds, “If that doesnâ€™t break your heart, you might want to get to the emergency room to see if itâ€™s still there.”Â I part company with him somewhat on this.Â This story doesn’t make me heartbroken: it makes me angry.Â I am sad for the little boy who now cannot go to school, which he loves.Â But I am outraged at those who think that this bears any relationship to justice.Â Sage Miller can’t go to school because Republicans think it is more important to protect the carried-interest loophole.Â The supposedly religious Christians who think we need to bring God into public policy might want to review the story of Nathan the ProphetÂ after they finish demonizing gays and lesbians. It also outrages me as a taxpayer.Â We are injuring these children, and that will injure our country in the future.Â You don’t have to be a bleeding heart, or Nathan the Prophet, to object to this.Â You just have to be a patriot. 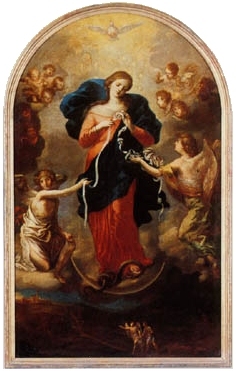 Author James WimberleyPosted on March 29, 2013 March 31, 2013 Categories UncategorizedTags Feminism, Religion and Politics18 Comments on Untier of Knots? The god of irony is everywhere and never sleeps.Â Who would have guessed that the first pope from the global South would be an ethnic European, from the most European southern country? …that this third non-Italian pope in several centuries would be from the most Italian country outside Italy and have Italian parents?Â Who would think that he would be right about poverty (against it, woo hoo) -Â and wrong on every other social issue, along with a dirty warÂ history that, let us say, has not been trotted out by the Vatican flacks for our admiration. If he’s not what the church needs, of course, it won’t be stuck with him forever, as he’s only nine years younger than the guy who just ran out of steam and resigned. Popes can be surprising, like Earl Warren. But I’m not betting the farm that the church stops taking on water. I do not seek to understand so that I may believe; but I believe so that I may understand. For I believe this also, that â€˜unless I believe, I shall not understand’.